Mrs Featherby had been having pleasant dreams until she woke to discover the front of her house had vanished overnight On a seemingly normal morning in London, a group of people all lose something dear to them, something dear but peculiar: the front of their house, their piano keys, their sense of direction, their place of work. Meanwhile, Jake, a young boy whose father brings him to London following his mother's sudden death in an earthquake, finds himself strangely attracted to other people s lost things. But little does he realise that his most valuable possession is slipping away from him. 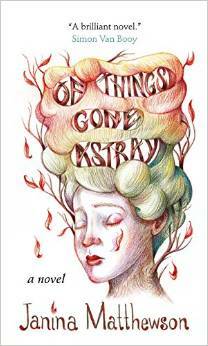 Of Things Gone Astray is a magical fable about modern life and values. Mrs Featherby lost her front wall. Delia has lost her sense of direction. Now anytime she wants to go somewhere she can’t get there. Marcus is a pianist whose piano keys have disappeared. Robert lost his job. He didn’t get fired. The building that his office was in disappeared and none of the neighbors remember it ever being there. None of his coworkers are in his contact list anymore. Cassie’s girlfriend didn’t come on the flight from Brazil so she sat down to wait for her. Now she’s turning into a tree right at the arrivals gate in Heathrow Terminal Two. Jake keeps finding lost things but he has a feeling that something he should remember is slipping away. This was a great book. Losing the things that were most important to them, made all the characters reevaluate what they wanted out of life. Magical realism is perfect for this book. I loved the fact that no one was the least bit surprised that Cassie was turning into a tree. It was just one of those things that happens. The stories of the people start to intertwine so they all end up helping each other break out of the routines that they were in before they lost things. Fun! I like my magical realism with a touch of humor and this sounds like it’s built right into the premise. Thanks for joining British Isles Friday!